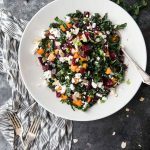 Sweet and spicy roasted beets and sweet potatoes tossed with crunchy kale, creamy goat cheese, sliced almonds and easy maple soy dressing. Prepare the beets and sweet potatoes: Preheat the oven to 375°F. Line two baking sheets with aluminum foil or parchment paper OR one baking sheet creating two sections with aluminum foil (so the beets will not bleed into the sweet potatoes). In a small bowl, whisk together the oil, honey and ginger. Drizzle half of the honey mixture over the beets and the remaining half over the sweet potatoes. Mix to combine. Bake at 375°F for 35 to 40 minutes until fork tender, let cool. Make the dressing: In a small bowl, combine the garlic, maple syrup, soy sauce, sesame oil and chili sauce. Whisk to combine and set aside.